The French government has introduced a plan to bring back national service for all 16-year-olds. It was an idea put forward by Emmanuel Macron in his presidential campaign, to promote a sense of civic duty and national unity among French youth. But some remain unconvinced of the benefits. The new national service will cover all 16-year-olds, girls as well as boys, and will be divided into two distinct phases. The first phase is a mandatory one-month placement with a focus on civic culture, which the government says will "enable young people to create new relationships and develop their role in society". Voluntary teaching and working with charities are among the options being looked at, alongside traditional military preparation with the police, fire service or army. The second phase is a voluntary placement of at least three months and up to a year, in which young people will be encouraged to serve "in an area linked to defence and security" - but again, they could opt to carry out volunteer work linked to heritage, the environment or social care. It's not quite the programme Mr Macron initially had in mind. 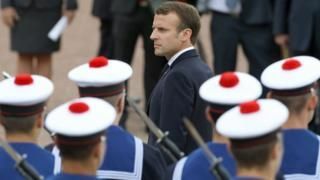 When he first floated the idea, during the 2017 race for the presidency, it was a sort of military service in miniature, with all French citizens forced to have a "direct experience of military life" for a minimum of one month between the ages of 18 and 21. That's now been softened and broadened into what's being called a Universal National Service - partly because of concerns that it would cost too much and overburden the country's armed forces. Even now, the programme is estimated to cost €1.6bn (£1.4bn; $1.8bn) a year to run, with €1.75bn of investment up front. The goal of this new-style national service, the government says, is to encourage young French citizens to take part in the life of the nation, and promote social cohesion. Consultations will now begin, with a view to rolling out the programme from early next year. But there is still a lot of detail to be hammered out, not least the legal basis. A working group, set up to look into the scheme, has warned that the French constitution bans the state from forcing an entire section of the population to spend time away from home, except in the case of national defence.